Oil painting on linen by Grant McSherry. 1200 mm x 710 mm. On February 20, 2002 a massive storm created huge seas at Ohope beach. Craig was watching the drama unfold when a log carried by a rogue wave bowled him over. His leg was broken. Craig had trouble walking any distance since then. Craig's wife, along with a friend & neighbour, installed a seat on the same site at Ohope Beach for his 33rd wedding anniversary... the ideal place for Craig to sit and watch the waves. 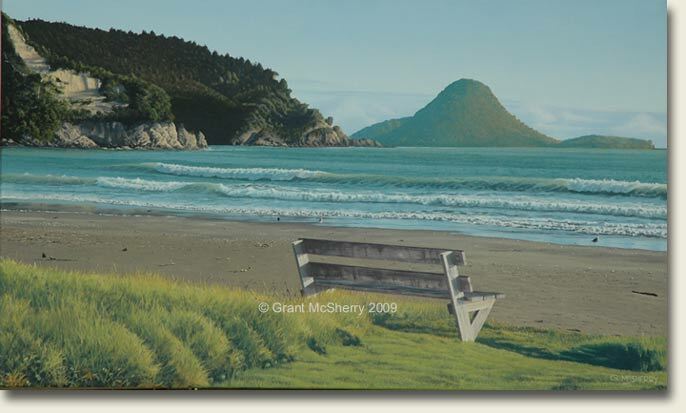 The imagery for the oil painting 'Craig's Chair' originates from time enjoyed with my family at Ohope Beach celebrating Dad’s eightieth birthday during April 2008. Very shortly after our arrival at Ohope that April, I was on the beach, gulping in the fresh coastal air, relishing the sounds of the ocean and searching for images that might inspire a really good painting. This bench seat, with the words 'Craig's Seat' neatly carved into the front of its back support, was the subject that immediately grabbed me. My family stayed in motels almost directly across the road from Craig's Chair and its environment. I thought this subject would yield an image that describes somewhere I would want to contemplate when I was home, far away from Ohope Beach… a nostalgic place on the wall to escape to. Naturally then, the very first Ohope Beach photo I took of over 300 between April 20 & 24 was of this chair and its vista. I could easily gaze out over the sea from our second story Motel balcony and when the seascape looked right I grabbed the camera and would be across the road within seconds. During my stay, the vista changed from hour to hour and day to day as Craig's Chair remained some sort of sentinel, occasionally occupied by a passerby. Despite unleashing my Nikon at the chair right from the first shot, it wasn’t until almost the end of my visit, and photo number 228, that the painting 'Craig's Chair' was finally conceived. 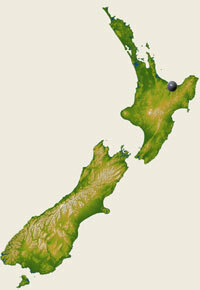 The imagery represents a typical blue morning on Ohope Beach. The light offered maximum scope for me to be able to later capture & accentuate the detail in oils everywhere from the headland right through to the foreground. As with all of my recent work, this image is not widely available as an art print. Up to only 195 Giclee fine art prints on canvas are now available as a limited release. A limited run of 450 offset prints on paper may be released at a later date. Original painting size:1200mm x 710mm.